Posted on November 25, 2012, in Uncategorized and tagged angora rabbit, black oil sunflower seeds, BOSS, conditioning mix, feed, fiber, growth, high protein, moderation, natural, overweight, safe, sunflower oil, sunflower seeds, tonic, unwilling does, winter tonic. Bookmark the permalink. 15 Comments. great stuff. i have 30 new zealands and they have been having letters of 10-11 all winter long and its been as cold as -18 so this info is valuable.. what is the best way to purchase it. i will grow some this spring. Yes, it has been brutally cold here also and the BOSS helps keep them warm. I buy the bags in the bird feed section at tractor supply I also plant the same seeds to grow my own! I planted BOSS in our greenhouse a few days ago, to transplant into our garden when the weather warms up a bit. Per your advice, i’ve been feeding them a few times a week to our four dwarf lops (two pregnant does) and they seem to like them. Our chickens have been going nuts for them as well! Thanks. My chickens go crazy for them also, I grew 70+ plants this year to make sunflower oil but the birds got there before me! I fed the rest to rabbits and chickens. Thanks for all the informations. I will begin to raise my first rabbits this winter and they will be outdoor, i want give BOSS but what is the quantity i must give ? Can they eat the other kind? 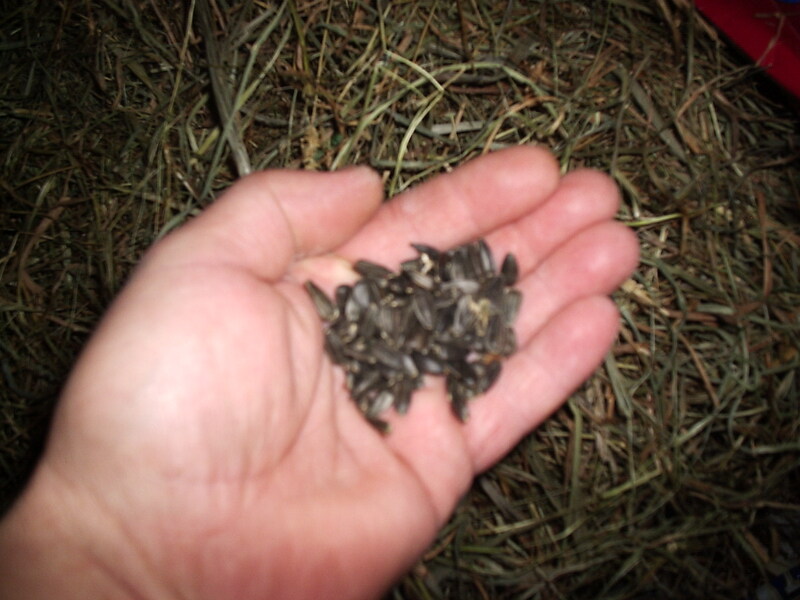 Or does it have to be the black sunflower seeds? Yes they can eat other sunflower seeds, the BOSS are much more nutritional. Is it ok to just feed them the heart of the sunflower seed instead of the whole seek? They will still get the same effect right? They will get the same affect other than the extra fiber from the shell, just make sure that there is no salt or other preservatives added. just regular bird seed BOSS? This is a great read! very informative! I’ve heard of your rabbitry. I think through BYMR. Can’t wait to look thru the rest of the page.